Pioneer Records launched its Out of the Woodwork Concert Series Jan. 28 at Hundred Wood, a gastro-pub restaurant located on Point Park University's campus in Downtown Pittsburgh. 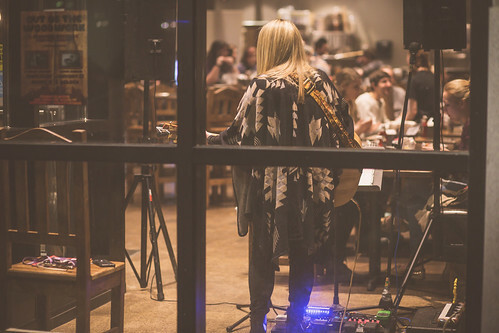 The concert series, which will continue with shows throughout the 2016 spring semester, is a collaborative effort between the student-run record label and restaurant. Hannah Jenkins, Pioneer Records' first recording artist, and Chase Barron, a junior majoring in multimedia, performed a combination of original and cover songs on their acoustic guitars. "The concert went really well! I've received a lot of positive feedback. It was great to play with Chase and have fun," said Jenkins, a junior sports, arts and entertainment management major. Barron remarked: "It was a blast. I was stoked to see so many people show up. I'm always looking for opportunities to perform. I'm definitely going to collaborate with this record label for the rest of my time at Point Park. Everyone I met from Pioneer Records is cool, motivated and friendly - and they believe in what they're doing." According to SAEM Associate Professor Ed Traversari, M.B.A., the concert was entirely produced by Pioneer Records interns Tyler McLaughlin, Evan Pearson and Ericka Thomas, along with Chris Bowen, School of Business graduate assistant; and Ashley Dobransky, SAEM assistant to the chair. "We spent months drafting different possibilities, adding and subtracting variables. Ultimately, we decided to have the event right in the heart of our campus. At this concert, I heard countless times from people about how convenient it was for them to make it," explained McLaughlin, a senior SAEM major. "My responsibilities in this concert series are to book the artists and keep them posted on important deadlines. I also assist with sound equipment and the merchandise booth," said Evan Pearson, a senior SAEM major. Sophomore SAEM major Ericka Thomas manages the record label's social media marketing efforts. "In this role, I use a lot of the marketing techniques I learned in my SAEM Marketing and Promotions class," she remarked. For McLaughlin, SAEM classes such as Business of Live Entertainment, Concert and Music Festival Touring, Recording Business and Legal Aspects of Sports, Arts and Entertainment have given him a solid foundation in concert event planning. "Shows likes this provide the perfect opportunity to use the skills gained in the SAEM program to go out and create something for yourself," said McLaughlin.